Sarri: "Today Jorginho was in trouble and on the bench there wasn't a player for that position so I need a player for that position." 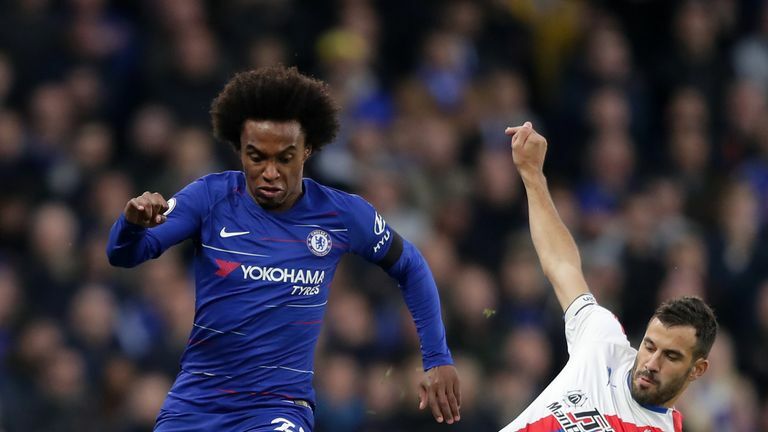 Chelsea head coach Maurizio Sarri has urged Willian to stay at the club following his goal in the 2-1 win at home to Newcastle. Chelsea head coach Maurizio Sarri wants to sign a replacement for Cesc Fabregas after watching his side beat Newcastle 2-1 on Saturday. Fabregas completed his permanent move to Monaco on Friday and Sarri's need was emphasised after he watched Jorginho struggle to dictate play against Newcastle. After the match, Sarri revealed he wants a replacement but is uncertain if, or when, a new recruit will arrive. "Today Jorginho was in trouble and on the bench there wasn't a player for that position so I need a player for that position." When asked if Chelsea will sign a replacement for Fabregas, he said: "I have no idea. Sarri was also quizzed on the future of Willian, who has been linked with a January move to Barcelona. The 30-year-old showed his value to Chelsea by scoring his side's winner against Newcastle to give Blues a six-point cushion over fifth-placed Arsenal in the race for Champions League qualification. Sarri on Friday insisted it was "impossible" to lose Willian, who has 18 months remaining on his current contract at Stamford Bridge, and he repeated his view on Saturday. "You know very well that Willian is a very important player," he said. "In my opinion, Willian has to stay with us because for us he is really a very important player, like Pedro. "[Callum] Hudson-Odoi is becoming for us a very important player. With Eden as a striker we need wingers so we need Pedro and Hudson-Odoi. And Willian, of course. For us, in this moment, he is a fundamental player." When asked about Willian's contract, he added: "Maybe he has 12 years of contract, I don't know the detail. You are trying to let me speak about something I don't know." Despite his side's victory, Sarri again bemoaned his side's mentality - a frequent complaint this season - for apparently being complacent after Pedro's opener. Chelsea took the lead after nine minutes, through Pedro, but Newcastle responded and deservedly equalised five minutes before half-time through Ciaran Clark before Willian's second-half winner. "After the goal, I think we thought 'now it's easy', but it wasn't," he said. "We slept for 20, 25 minutes, so at the end of the first half we were in trouble. We need to improve in the mental reaction because after the first goal something happened. "We stopped playing for 20 minutes. But it was really very important to gain points today. That was enough."